« Sidecar on the Roof… Another Day at Gearhead Grrrl’s R&D “Skunkworks”! To the point that it’s hard to get a picture of the train without a horde of happy humanity framing if not obliterating the view of the train. 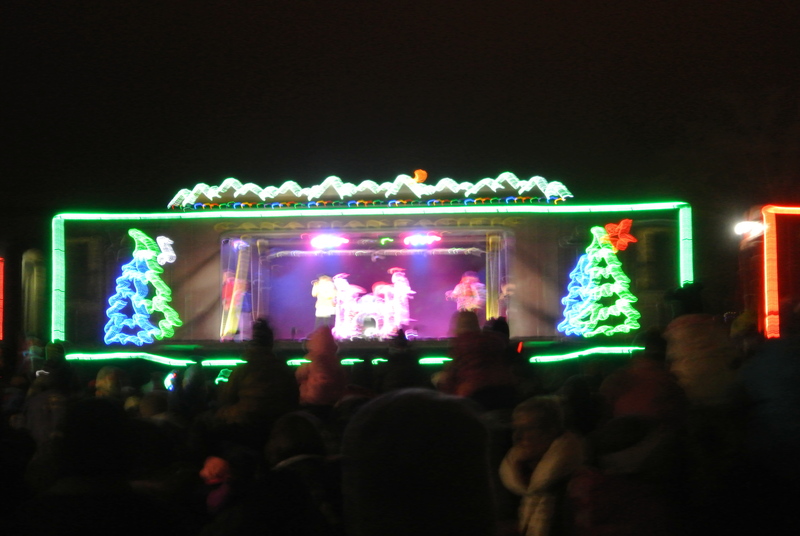 I caught last night’s stop at Cottage Grove and it was typical… Attendance of at least 1400 (that’s how many glow sticks they gave out before they ran out), traffic jams on the 4 lane freeway leading to the stop, and folks not complaining a bit about parking half a mile away. ‘Twas a successful fundraiser for the local food banks too, being the focus of a fundraising campaign that brought in over $100,000 and filled a good sized truck with food to boot. The music wasn’t as good as previous years, and by now I’ve pretty much got the script of the ceremony with the local food shelf head and politicians memorized… But who cares! Canadian Pacific’s top management of course has far divergent goals for their railroad, more along the lines of chasing away those pesky new (and a few old) customers so they can concentrate on running predictably profitable unit trains of oil and frac sand… The farmers who kept CP alive for over a century be damned. Heck, CP management even had the nerve (or stupidity) to propose a merger with Norfolk Southern. That’s roughly equivalent of the fat chronically unemployed nerd who lives in his mom’s basement proposing marriage to the young starlet who’s preoccupied with picking between multi million dollar contract offers from the studios, and even the management of what I’ve heard referred to as the “Nazi Southern” gave CP a prompt and terse “NO!”. 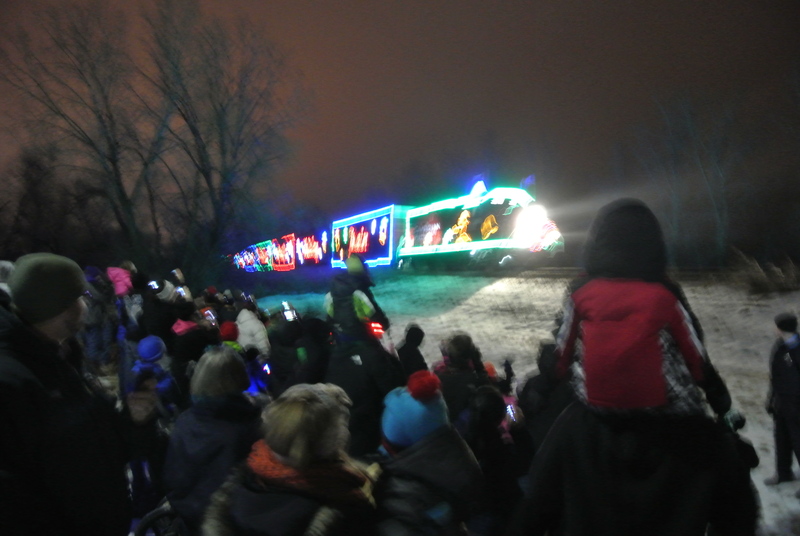 Being on paper the least profitable train that CP runs, the Holiday Train has thus become a target for CP management’s machetes. Used to be that every CP employee on the sub accompanied the Holiday train, a virtual army in orange vests that assured the train’s safe passage. Despite the fact that most of those folks would have been on the clock anyway, CP in their infernal wisdom seems to be trying to turn those duties over to whatever volunteers the community the train is stopping in can muster. Heck, used to be that even Santa was usually a CP employee, and rode the train from stop to stop… CP has now advised the local food shelves and their supporters that if they want a Santa, they’ll have to supply ’em. Fortunately was for but a moment. 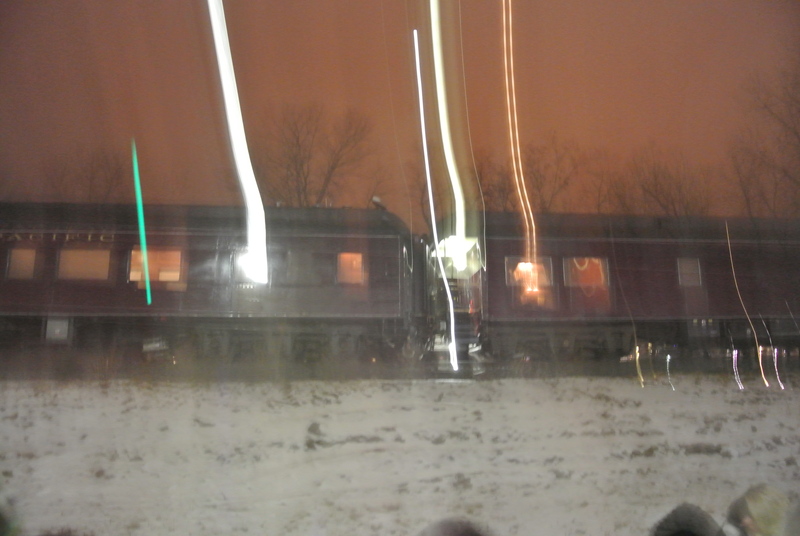 But in over a decade of following the Holiday Train, I’ve never seen the lights go out. 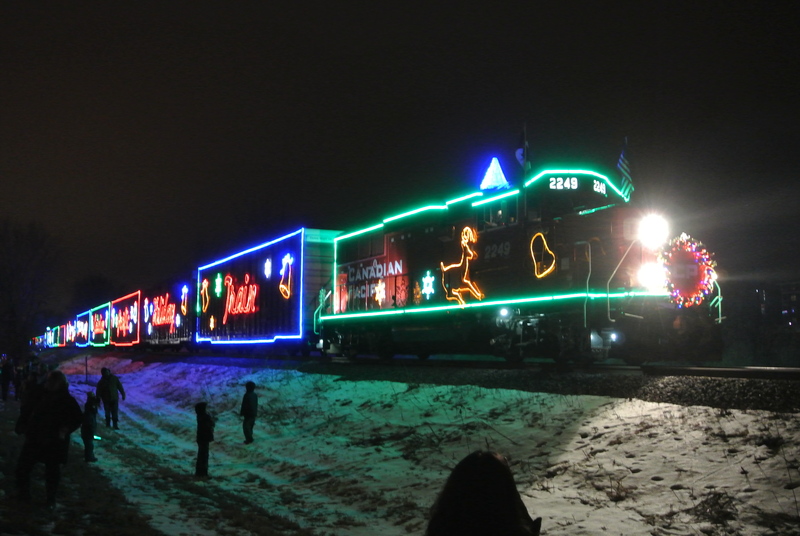 Heck, they even leave every single light lit and flashing when the train’s parked deep in the rail yard or rolling across the empty prairies in the middle of the night. Then there was the acrid smell coming from somewhere around the power cars (good thing there were two, each with a pair of Cat gensets IIRC) Of course, in the mindset of the Wall Street wiz kids currently running CP, a couple boxcars with big ‘ol emergency generators is a total waste of assets, to be liquidated ASAP. And the boxcars fitted out with stages, that get used in this “non revenue” service for only a month a year? Probably giving CP’s top management ulcers!